There is just something about the new Acura NSX that makes people love it or hate it. EVO finally got the chance to put a Honda-badged version of the NSX through the paces, but Henry Catchpole – the driver in the video – didn’t seem too enthused about his time behind the wheel. I won’t ruin the experience of the video for you, but at one point, Catchpole blames jet lag and being short on time for his less-than-stellar attitude when reviewing the car. In the video, Catchpole is piloting the NSX around Thermal Raceway. The car itself sounds amazing, and even Catchpole claims you can feel the electric motor up front kick in and pull the car as he comes out of a corner. While he was putting it through the paces, it almost seems like he was afraid of the car, as he didn’t really get on it as hard as I would have. The important part about the video, however, is that you get another chance to hear and see what it is like to pilot what was one of the most anticipated supercars prior to its debut. Try not to hate on Catchpole or EVO that much for the lack of normal camera work. As the video starts off, we’re told that EVO didn’t have time to send a full camera crew, so for filming purposes, the team was shorthanded. 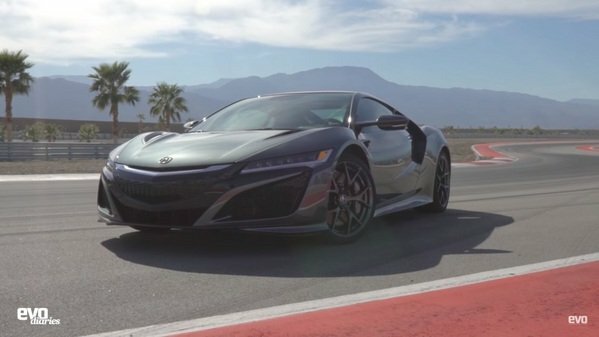 Either way, click play and take a little trip around the track in the new NSX. To me, it’s worth it just to hear the engine as the car is put through the paces.